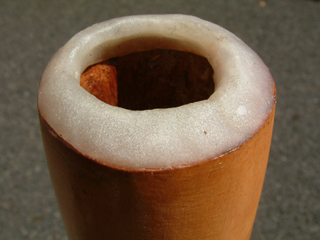 A didgeridoo (Also didjeridu, didjiridu and didjerry.) is a hollowed out log that is used to make a musical sound. Indigenous to northern Australia it is considered as one of the first musical instruments, however I would argue that drums or banging on something happened before someone blowing through a hollowed out log. After finding a proper hollowed out log, usually hollowed out by termites a mouth piece is often added by melting beeswax onto it. This allows for a better seal between the mouth and the dideridoo. Finding a proper hollowed out log is not as easy as it might sound. The length, the amount hollowed and the overall size all effect sound quality. 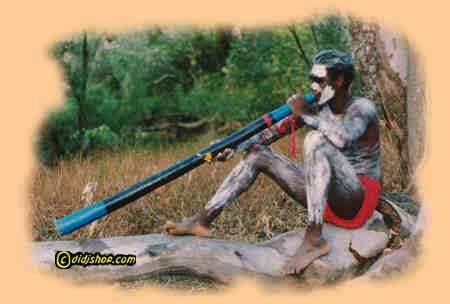 Currently you can purchase or make a didgeridoo from PVC pipe. We got the opportunity to play with a PVC made on on a recent camping trip. In the 2005 Dreamworks Pictures movie, War of the Worlds, a didgeridoo was used (along with computers and other sound-altering devices) to create the memorable war cry the alien Tripods make. A 2005 study, published in the British Medical Journal, found that learning and practicing the didgeridoo helped reduce snoring and sleep apnea, as well as daytime sleepiness. This appears to work by strengthening muscles in the upper airway, thus reducing their tendency to collapse during sleep. Want to get your own? You can easily purchase one from The Didjshop however they only sell authentic Didgeridoo's not the PVC ones and the least expensive is over $100 US. PVC versions can be found online for a little as $34 US.